You’re gonna think I’m stuck in a 1984 time warp because this 3rd book was also published in 1984. William Oncken, Jr. wrote the book, Managing Management Time™ and created a proprietary training system by the same name. He was born in Buffalo, New York and graduated from Princeton in physics. During World War II he worked on the famed Manhattan Project. He mostly worked in management consultancy and established his own consulting firm in 1960. In 1974 he co-wrote an article in the November/December issue of the Harvard Business Review. It became one of the most requested reprints in the history of the Harvard Business Review. 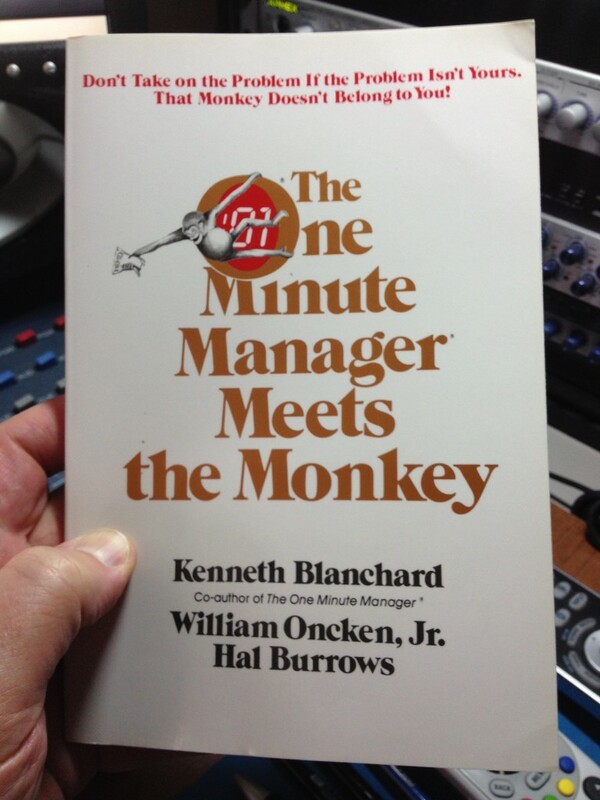 Ken Blanchard, the author most noted for the One-Minute Manager series of books, published his own version of Oncken’s Managing Management Time™ in collaboration with Oncken in 1989. Blanchard’s One-Minute Manager brand was ridiculously strong at the time and I’d imagine that book garnered much wider fame than Oncken’s original book. I was never very attracted to the One-Minute Manager series, mostly because the business parable or fable bores me. And seems hokey. I confess I’ve never read a business parable that I found attractive*, but I was so fond of Oncken’s original work I bought a copy of Blanchard’s collaboration with him. I will admit there was a book entitled, The 59-second Employee: How to Stay One Second Ahead of Your One-minute Manager that I found entertaining. I’ve still got a copy of that somewhere, but let’s get back to Mr. Oncken’s work. By the way, you can find a used copy of this book over at Amazon for a penny. I’ve now given you 3 books – three great books – that you can buy for a penny each. And don’t fret about the date of publication, 1984. All of these books have messages that hold up over time because people haven’t changed, even though technology, economies and other things have. Like the other two books (#250 and #251), this book is focused on people. But unlike the others, whose authors I admired at a personal level because I found out more about who and what they were, I admit I didn’t do that with this book. Oncken was a mystery to me, but throughout the book he revealed key parts of his life. The book has enough biographical information to serve the reader with a better understanding of the author. Mr. Oncken’s company was based in the Dallas area and it still is today. When I bought the book in 1984 I’m almost certain that I was initially drawn to the illustration on the front cover. I was never fond of time management books or systems. But when I first read the book I was reminded of a neighbor who lived two doors down from us in the early and mid-1970’s when I was just a kid. He was an “efficiency expert.” I was fascinated by that because I had no idea what it meant. He also practiced karate and would sometimes be seen wearing his karate get up as he went to and from wherever he went to beat up people. Our dads weren’t efficiency experts and they sure didn’t practice karate so he was quite the man of mystery in our neighborhood. I realized early on in reading this book that Mr. Oncken was likely an efficiency expert. “Where did the time go today?” Tens of thousands of managers are asking this of their secretaries around quitting time every day. Oncken uses juggling oranges as a metaphor for managing these areas. That means managers have a 3-orange problem and professionals have to work on keeping all 3 in the air at the same time. Chapter 2 is called, The Management Molecule. It’s a comprehensive description of how managers need to formulate their own molecular list to help them manage all of their daily interactions. Every phone call, every interoffice encounter, every meeting…the author includes them all. This chapter was so not up my alley when I first read it, I had to re-read it and it wasn’t fun at all because I’ve already told you I’m not a big fan of the whole time management thing. But I determined to grind it out and you should, too. It drives home the point of controlling your time and work as much as possible. He ends the chapter using an illustration of a co-worker who is in a habit of accosting you every Monday morning with stories of his Sunday afternoon golf game. You’re polite so you suffer this time waste every Monday. It costs you an hour every Monday and drives you crazy. You’d love to discourage this behavior, but you don’t know how. Next Monday when he starts his story, you will open your desk drawer and pull out your molecular list to see if his name is on it. If not, you’ll say to him, “I don’t have to listen to this. Your name is not on my molecule. See for yourself.” With that you thrust the list under his nose, and motion him toward the door. His feelings, since he is an obvious amateur, will no doubt be hurt. But guilt feelings will no longer afflict you: Your molecular list gives you solid moral justification for insisting upon first things first! Funny, isn’t it? And you’re saying, “I could never do that.” That was my reaction, but I had a bigger reaction. It’s a theme in all these books so far. Candor. Crazy, seemingly insane straight-forward conversation where you call it like you see it. How can you not be attracted to a guy who can write that? I was. I still am. But suppose, on the other hand, his name is on your molecular list; what then? You will patiently hear him out, of course. And the time lost in so doing you will charge off to the administrative overhead cost of molecular maintenance. Even though I’m not fond of the business parable format, you may find The One Minute Manager Meets The Monkey to be an easier to digest delivery of the message. One advantage of that book are the pages where the authors distill an idea in a single sentence or two. I’m going to list those here because they’re gems of wisdom. Rule 1 – Descriptions: The “next moves” are specified. Rule 2 – Owners: The monkey is assigned to a person. Rule 3 – Insurance Policies: The risk is covered. Rule 4 – Monkey Feeding And Checkup Appointments: The time and place for follow-up is specified. 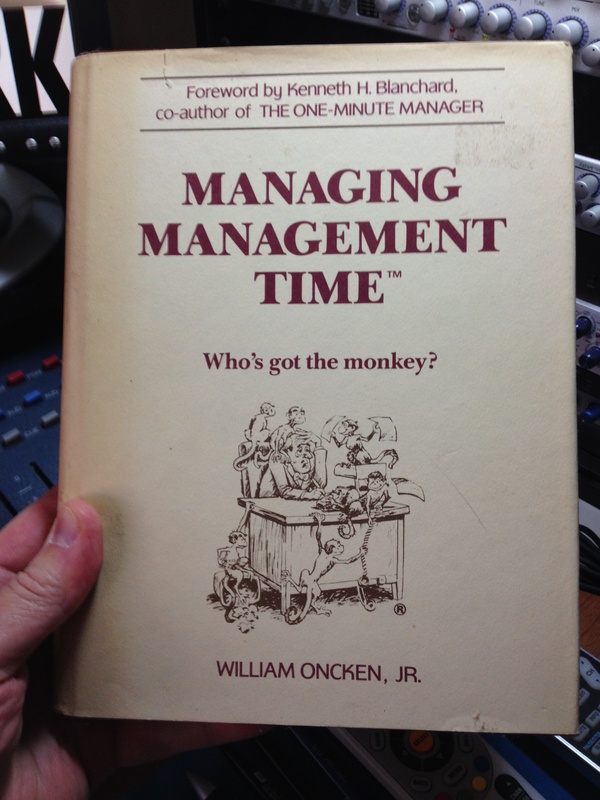 The final chapter of The One Minute Manager Meets The Monkey is entitled, “The Ultimate Conversation.” It’s just 2 pages long, but it’s a terrific way to end today’s show because it properly distills the benefits of Oncken’s system. * Not entirely true. While recording I remembered one that I did rather enjoy, Leadership and Self-Deception: Getting Out Of The Box by The Arbinger Institute.